Chanderiya Lead-Zinc Smelter (CLZS) is one of the largest zinc-lead smelting complexes in the world. Its current metal production capacity is 620,000 MT per annum including 535,000 MT per annum of zinc and 85,000 MT per annum of lead. In the year ended March 2018, Chanderiya produced 497,049 MT of zinc and 72450 MT of lead. The main products are special high grade (SHG) zinc, continuous galvanizing grade (CGG) zinc, prime western (PW) zinc and pure lead. It also produces a number of valuable by-products including silver. Chanderiya utilizes a combination of best proven technology and innovation to continuously improve environmental and operational performance. This approach has enabled us to be one of the largest and most efficient zinc and lead smelting complexes in the world. Chanderiya is located 110 Kms North of Udaipur in the State of Rajasthan, India. It was commissioned in the year 1991 with an initial production capacity of 70,000 MT per annum of zinc and 35,000 MT per annum of lead. In the past 6 years, the capacity of the plant has been expanded five folds to its current capacity. Chanderiya Lead-Zinc Smelting complex comprises of one lead-zinc Pyrometallurgical smelter (105,000 MT zinc and 35,000 MT lead), one Ausmelt lead smelter (50,000 MT) and two Hydro metallurgical zinc smelters (Hydro I & Hydro II). It employs Roast Leach Electro-winning Technology in its Hydro metallurgical smelters, Imperial Smelting Process in lead-zinc smelter, and Top Submerged Lance Technology (Designed by M/S Ausmelt Ltd., Australia) coupled with Cansolv Technology for its lead smelter. The complex also has 234 MW (77 + 77 + 80 MW) of captive thermal power capacity to supply the power requirements for its metallurgical operations. It also has 14.81 MW of DG set and 13.7 MW (9.4 MW+4.3 MW) of power generation capacity through waste heat recovery. Chanderiya Lead-Zinc Smelter complex is certified for Integrated Management System comprising of: the Quality Management System (ISO 9001:2008), Environmental Management System (ISO 14001:2004), Occupational Health and Safety Management System (OHSAS 18001:2007).The CSC is also certified by QCFI for 5-S workplace management system. 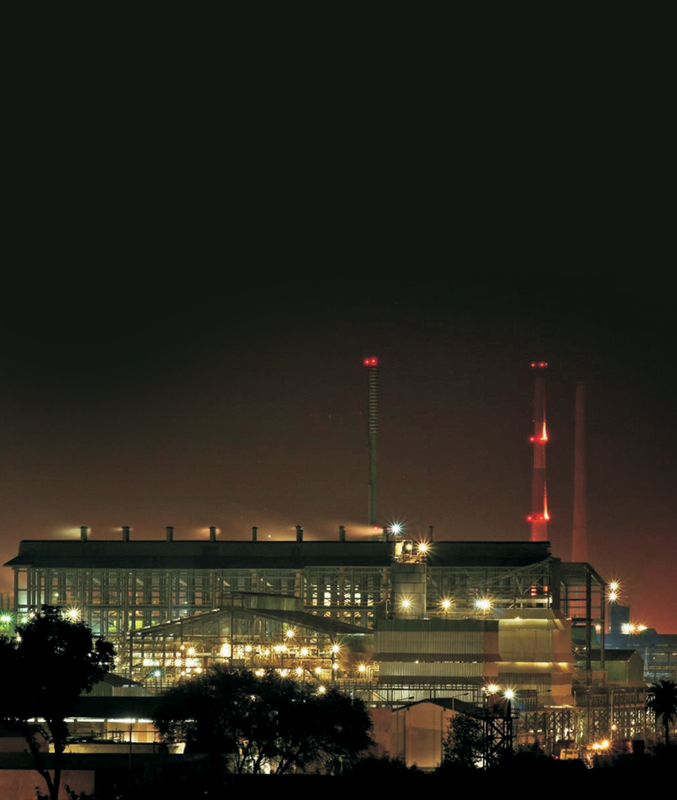 The Chanderiya Lead-Zinc Smelter complex has been bestowed many awards like Green Manufacturing Excellence – Challenger Award in Sustainable Development by Frost & Sullivan; Hydro 2 smelter was awarded Indian Manufacturing Excellence Award Gold Category by Frost & Sullivan; IMC Ramakrishna Bajaj National Quality Award for Performance Excellence; International Green Apple Award 2012 from the Green Organization London for gainful utilization of its waste. The Pyrometallurgical smelter uses the Imperial Smelting Process (ISP), whose process starts with sintering, where lead and zinc concentrates, bulk concentrates ( a mixture of zinc and lead concentrates) are blended with secondaries and fluxes. The mixture is passed through the sinter machine to remove sulphur. The gas generated from the sintering process is sent to the sulphuric acid plant. The de-sulphurized output of the sinter machine is broken for size reduction before being fed into an Imperial Smelting Furnace, or ISF, where it is smelted with preheated met-coke and air. The Imperial Smelting Furnace (ISF) is designed to simultaneously produce molten zinc and lead by smelting agglomerated Sinter with preheated coke and preheated blast air. Chemical reaction between air and the coke produces carbon monoxide and generate heat to smelt the metallic oxide in the charge into the elemental metal. Molten lead falls into the bottom of the furnace from where it is tapped and sent for refining process. At the temperature of operation, metallic zinc is formed as a vapour. Zinc vapour passes through the Condenser where it gets absorbed by lead .The lead is cooled to separate zinc and the molten zinc is passed through Double distillation column for further refining. Through this process, zinc is produced as a major product and by-product is Cadmium. The waste gases of ISF leaving the condenser after zinc is condensed pass through a gas cleaning system where they are cooled and cleaned of particulate matter. These gases contain carbon monoxide of low calorific value. After cleaning, Low calorific value is utilized in preheating the furnace blast air and in preheating the coke. Any remaining excess gases are passed through a Boiler for steam generation which is being utilized in plant operation. The Pyrometallurgical process involves the smelting of lead and zinc together as described under “Zinc Smelters”. Lead removed from the Pyrometallurgical process is sent for further refining where it passes through a series of processes to remove impurities. In this process, silver is also produced as a by-product. The refined lead is cast into lead ingots. Our Ausmelt lead plant is based on Top Submerged Lance technology where lead concentrate is smelted directly in a vertical furnace along with flux. Lead bullion produced in this process is then treated in the lead refinery plant to produce high purity lead ingots. Off-gas containing sulphur dioxide gas is then cleaned and treated in the sulphuric acid plant.